Front runner Redzel showed his affinity for a rain affected track with an all the way win in the Group 3 $150,000 Hall Mark Stakes (1200m) at Randwick today. Redzel, above. leads all of the way to win the Hall Mark Stakes at Randwick. Photo by Steve Hart. The Team Snowden trained Redzel was finally rewarded for his consistent Sydney Autumn Carnival form when Kerrin McEvoy let the four year old dictate the tempo up front before holding off all challengers in the line to the line. 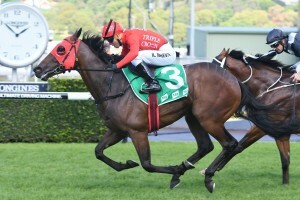 Redzel’s win today followed a first up second to English in the Group 2 $500,000 Hyland Race Colours Challenge Stakes (1000m) at Randwick on March 4 followed by a second to stablemate Russian Revolution in the Group 1 $700,000 Nathan’s Famous Hotdogs Galaxy (1100m) at Rosehill on March 18. A drop back to Group 3 level was also a telling factor for Redzel recording his first win over 1200m and his sixth win from sixteen starts. “He has had a couple of goes at the distance with not even a placing but with conditions to suit off the back of a nice second in the Galaxy, he was able to dictate it today,” McEvoy said. “There might be some races for him during the Carnival in Brisbane. Redzel was always the one that punters wanted to be on and went to the post as the $2.80 favourite while runner up Counterattack was a $7 at start time. Counterattack put the pressure on Redzel at the top of the straight but couldn’t get the better of him while the Darren Weir trained Hellbent ($3.90) fought on well in the straight to hold down third position in front of $26 chance Royal Tudor.